Grand Theft Auto: Liberty City Stories is the first GTA which is specially made for the PlayStation Portable. This GTA takes you back to Liberty City, three years prior to the events in GTA III. The city is strangled in an everlasting war between different mob families and other gangs. You are Toni Cipriani, the character that you also saw in GTA III. Of course, next to all the things you are used to from GTA III, GTA Liberty City Stories has a few new things to offer. There are some small differences to discover in town, in which you can now cruise around with a motorcycle. And last but not least, for the first time since GTA2 you can do multiplayer without any modification! 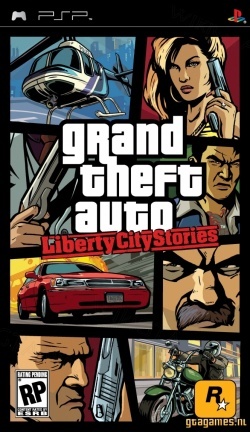 GTA Liberty City Stories was supposed to be a PSP exclusive but a few months later, the game was ported to the PlayStation 2 and came out June 6th 2006. There are a million stories in Liberty City. This one changes everything. Once a trusted wise guy in the Leone crime family, Toni Cipriani was forced into hiding after killing a made man. Now he's back and it's time for things to put right. The streets of Liberty City are in turmoil. Warring Mafiosi vie for control as the town begins to self-destruct under waves of political corruption, organized crime, drug trafficking and union strikes. No one can be trusted as Toni tries to clean up the mess of the city's chaotic underworld. Deranged hitmen, morally depraved tycoons, cynical politicians and even his own mother stand in his way as Toni tries to bring the city under Leone control. Forced to fight for his life in an odyssey that will shake Liberty City to its foundations. Toni must use any means necessary to secure his place in the leadership of the Leone family in a town up for grasp. The missions in Liberty City Stories are much shorter than those in Grand Theft Auto: San Andreas. Most of the missions take only 15 minutes and don't have more than 3 steps, so the missions remain playable on the PSP. Despite the shorter duration of the missions there are more than enough missions which will keep you busy for at least 40 hours. This page was last modified on 22 September 2015, at 10:46.